No blog posts for this week - sorry everyone! I'm off up North, this whole week for work. Loads of good food, at every stop. Time to do away with all that bad food karma. A new weekend looms ahead and I am ever hopeful I will find great food out there somewhere. Since it's a Fly-day, I thought we should celebrate with a treat, we are so fond off. Always around when we need it, roti canai or the super-stretched version aka roti tisu is one of the best inventions ever. Filling our rumbling tummies, at a minimal cost, there are loads of versions of this perennial favourite. 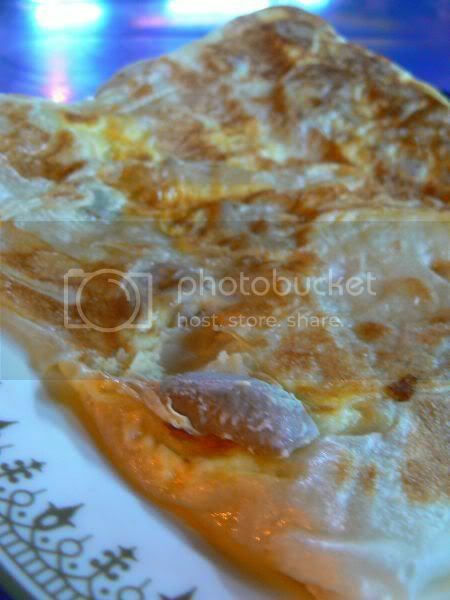 A result of the tough competition between the mamak stalls, you get roti canai with the pungent durian, diced up and fried to be roti canai goreng or stretched thinly and cooked till crisp, to be an enormous roti tisu that can feed at least 3 people. This particular shop in Petaling Jaya Old Town, opposite the wet market is one of those, which comes up with interesting varieties. Their roti tisu special is unlike the thin and tall version from Kayu Nasi Kandar, but has a hidden element within the crisp folds - a layer of decadent Milo powder and condensened milk. Very sinful but oh so delish, that one piece is never enough. Unfortunately, they don't do Milo Ais like the Milo truck (can someone tell me, why does Milo taste so much better from the green truck and in small paper cups?) hence, you have to settle for their Milo Shake. 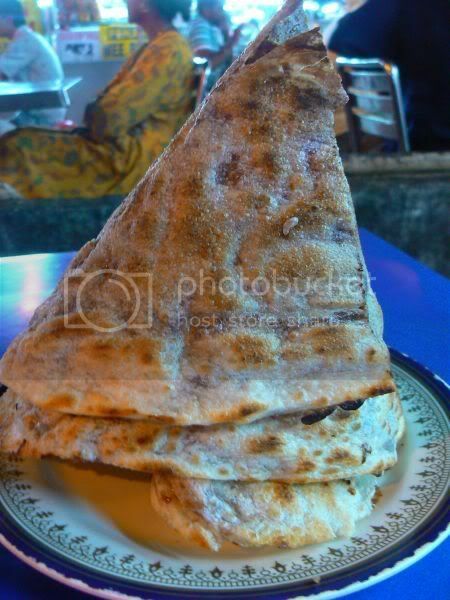 They also do great roti canais here - fluffy and not too oily. 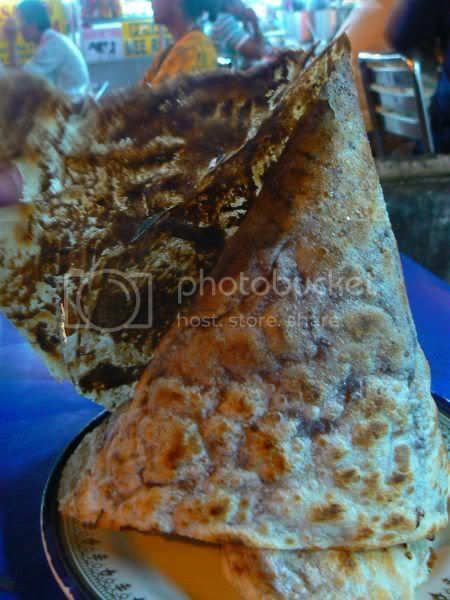 Splashie Boy had their roti mushroom - a fluffy creation with egg and canned mushroom slices. Originally a stall, business has been so good, they have now shifted into a shoplot. Aside from rotis, they also serve mee rebus, mee goreng, tandoori and etc. Tables and chairs are laid outside, making it a pleasant dining experience especially during this current hot and humid weather. Like I mentioned earlier this week, food selections last weekend seemed to be pretty dissapointing. I reckon it was all bad karma as almost everything we tried was just mediocre or plain terrible. However, at the end of the weekend, I did get to sample D'lish's new menu offerings. Didn't snap any pictures at all but that was definitely the most satisfying meal. I love the new salads - the roast cauliflower salad is my favourite and the Vietnamese pho beef noodles is also great comfort food for the soul. We were looking for a new place to try and found this place along Mid Valley Megamall's row of restaurants that face the Boulevard area. Next to Seed Cafe, this is the Western attempt by Crystal Jade, the Singapore restaurant renowned for their Chinese offerings especially xiu loong paus, roast pork, roast duck and dim sum. Although they claim to serve "casual chic dining", the food here is a mish mash of current trends i.e. the Hong Kong cafe style food aka char chan teng food, chocolate fountain, chocolate fondue, tapas items and etc. However, instead of the noisy casual experience you get in the chan teng cafes, dining at Amuleto is peaceful and more pleasant with their red sofas and flower decorated glass topped tables. We started pretty well with the Quartet of soups(RM12) - mushroom, pumpkin, French onion and broccoli. Served in small glasses with straws, you get to taste all their different varieties with this one order. Our overall favourite was the thick and creamy mushroom soup, followed by the robust tasting French onion soup. 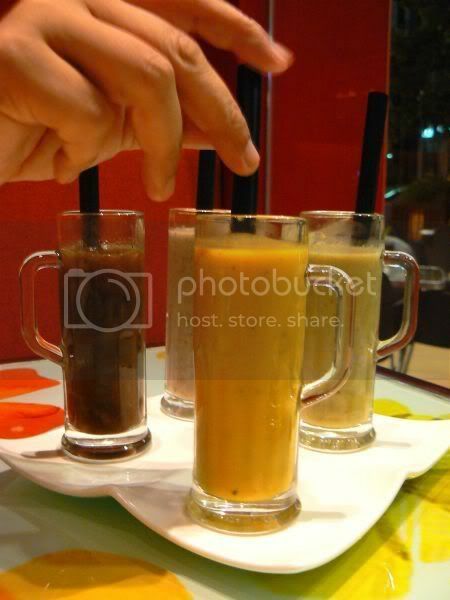 Although it is an interesting concept to use a straw to drink your soup, on practical terms, it does not work well since it is hot soup you're slurping down, which can singe your tongue, if you're slurp too fast. Even though the soups were tasty, I didn't like how they left quite a bit of fibre in the soup like stray bits of bay leaves. The menu has steaks, tapas items (which looked good for a quick bite), fried rice (with olive oil), pastas, rostis and chan teng staples like cheesy baked rice. As we didn't want a heavy meal, we opted for light meals like pasta and cheesy baked rice to share. My seafood spaghetti alio oglio (RM16) was mediocre - I didn't like the overcooked texture of my spaghetti, definitely not al dente. When it was served hot to me, the taste of the olive oil with the seafood was not bad but it got cold quite quickly and turned out pretty blah at the end. 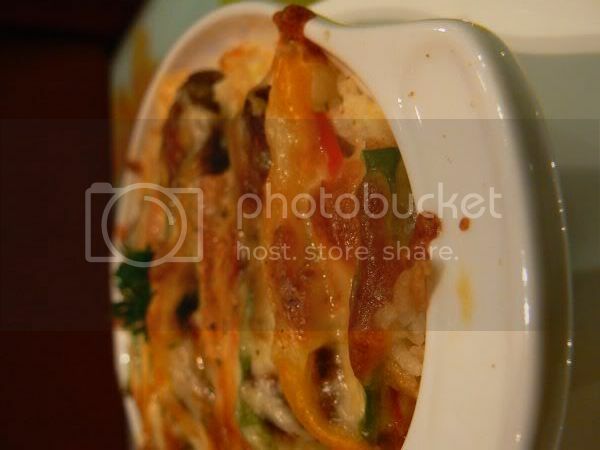 Splashie Boy's cheese baked rice with sliced beef (RM19) was ok-lah. Nothing much to shout about and just good as a tummy filler. Somehow, I don't think I will be rushing to return to dine here for a long while. Not sure whether I ordered the wrong items but I just didn't think their menu items will make them stand out amid the sea of Hong Kong chan tengs which are found all over the place. Prices may make them exceptional as they are offering the chocolate fountain and the salad bar for RM16, hence you won't need to patronise the hotels. The only one thing I really liked of this place was the deep red colours they used on their walls and the chairs. They also have an outside area with televisions, which got a few customers who wanted to drink in peace while they watched the Thomas Cup final. Tel : 03 - 2287 4128. A short and sweet (or shouldn't I say savoury?) post today. I've blogged earlier about K.Intan, one of my favourite places for wantan mee (we often buy back the noodles for home use) but sometimes when I get bored with the toppings there, I eat at this stall located at Kedai Kopi Wah Cheong. Run by an old man with a grumpy lady with glasses, they serve wantan noodles with a variety of toppings. I've eaten the basic char siu version, which is also good but my favourite is their braised chicken feet with Chinese mushrooms. The chicken feet is tender and tasty (from the deep frying). Add chewy wantan noodles and I am in heaven. I also love the Tong Kee stall selling egg tarts and sweet things here. Gives me a reason to take a break during work and indulge in some sinful egg tarts without driving down to Kuala Lumpur. What a weekend! Unfortunately, it wasn't a weekend for great food, as the places we tried were dissapointing. Don't worry, I will share with you all the sordid details later this week. I did get to try something I have been meaning to sample for the longest time ever. I first read about this place in Damansara Uptown from the Chinese papers. Seems the roast duck here is so popular, there will be a long queue waiting patiently for their turn. I inadvertently found out it opens pretty early during the day, when we drove past yesterday afternoon. Splashie Boy spotted his dream drive - the Hummer parked nearby at the luxury car showroom. While he drooled over the Hummer (just RM580,000, a song compared to its original price of RM630,000), I took my time at the roast duck stall. There was a small wait, which gave me a chance to check the place out. Sharing the same premises as Damansara Hokkien Mee, the ducks were fresh from the oven. 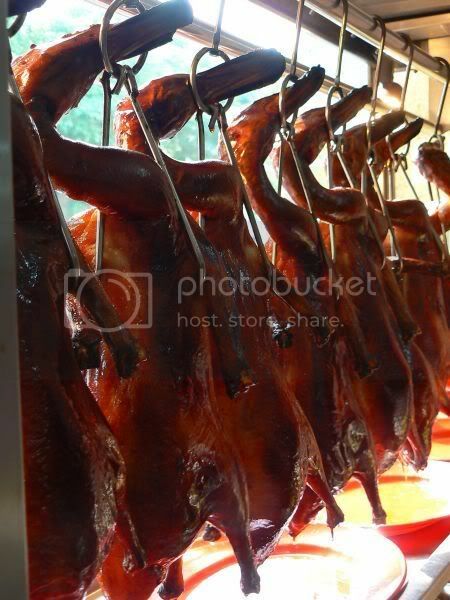 Everytime, the fella split the duck open, to tip the juices out, there would be small puff of smoke. I asked the owner, what was the difference between Guangzhou roasted versus the ones we get, and he was very non-comittal, just saying that it is the same. A whole duck is RM40, a half is RM20. 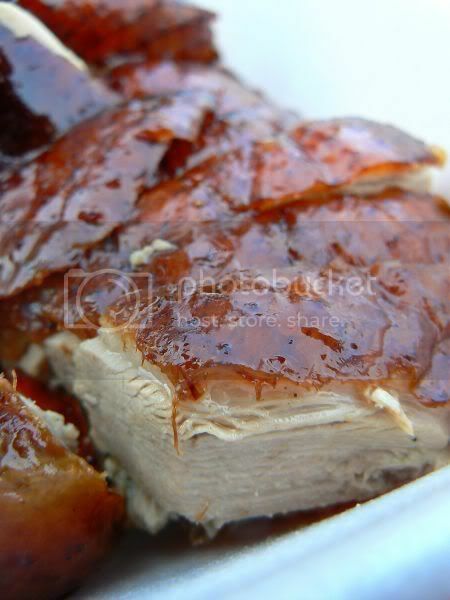 As I packed the roast duck home, I quickly snapped pictures of it before sampling a piece. The meat was juicy and tender. However, the skin wasn't crispy. I suspect this could be due to them not bathing the roast duck with hot oil, before serving it. Nevertheless, the roast duck still tastes pretty succulent. I would imagine, it will taste sinfully good (and cholestrol laden) with a plate of fresh-from-the-wok midnight black Hokkien noodles with super guilty deep-fried lard bits. 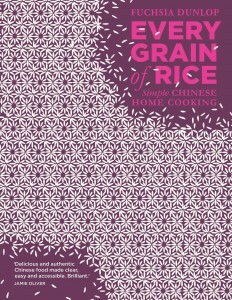 Nope, it is not Mao's Little Red Book but for enthusiastic foodies or culinary adventurers, this will be THE holy bible on what to eat in Asia. 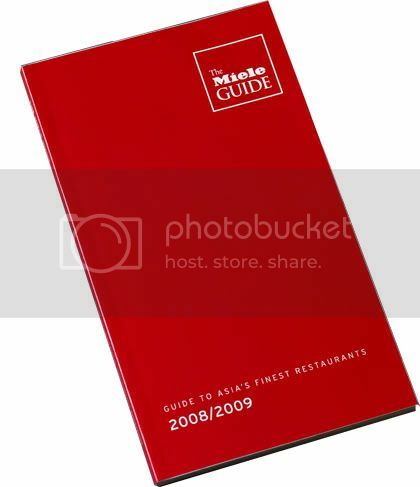 Sponsored by Miele, the guide is set to be Asia's first truly independent regional restaurant guide when launched in October 2008. Unlike other guides you find on the bookshelves, this guide involves no free meals or advertising from restaurants (something I absolutely believe in!). Instead, it will be based on food lovers votes i.e. people like you and me! For the 2008/2009 edition, the guide will cover restaurants in 16 Asian countries—Brunei, Cambodia, China (including Hong Kong and Macau), India, Indonesia, Japan, Korea, Laos, Malaysia, Myanmar, Philippines, Singapore, Sri Lanka, Taiwan, Thailand and Vietnam. So how do you get involved in a part of culinary history?? A shortlist has been drawn from the region’s top food critics and all you need to do, is vote which restaurants you think are the best. And if your favourite restaurant is not on the shortlist, you’ll have the option to nominate and vote for it too. From these results, a list of Asia’s top restaurants will be drawn. The people behind the guide, will rank and profile in detail the top 20 in Asia. The rest will be categorised by country, city and cuisine. To get your fingers clicking, there's a sweet treat also for your efforts - a chance to win an opportunity to dine at Asia's best restaurants and stay in one of the region's most luxurious hotels. You also get special discounts for the guidebook. So what are you waiting for, just click this link to vote and start creating some history. I have in some small part, got involved in the guide, hence it will be great for your votes to also be counted. For more details, you can go to the Miele Guide's website, Chubby Hubby's post on this (he and his wife are the people behind it) and their facebook site. If you wish to see what it looks like when you vote, Popagandhi, who did the web development has screenshots also on her blog. 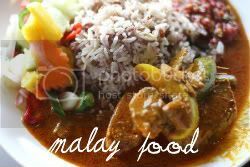 Working in Shah Alam can be a real pain sometimes as good food is not easy to come by. One day, when I was exploring Section 13's shophouses, I discovered they had my favourite Malay stall - Restoran A. Hassan. Ever since then, it has been my regular lunch time place. 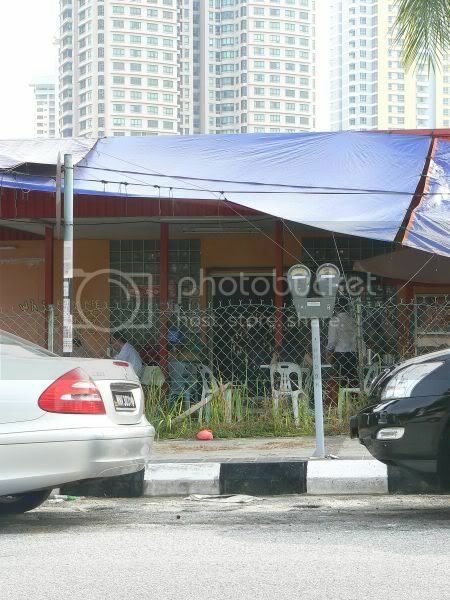 Restoran A. Hassan made its name with the famous ayam kampung goreng. You can find a stall or a restaurant open at quite a few places - USJ Taipan, Puchong, Cheras, Taman Desa, Kampung Baru and etc. I've blogged about the Kampung Baru outlet before, which still remains my favourite outlet as the dendeng with the percik sauce is to die for! If you plan to eat here, do come early as this place gets super packed with people after 12.30pm. Since the shop is quite small (just a single lot), tables and chairs are laid out at the walkways. You will find students from the nearby university, office workers and even high ranking police officers dining here for lunch. Just select what you wish to have for lunch from a spread, which consists of ayam kampung goreng, clams, ayam percik, fried fish, various ulam and etc. 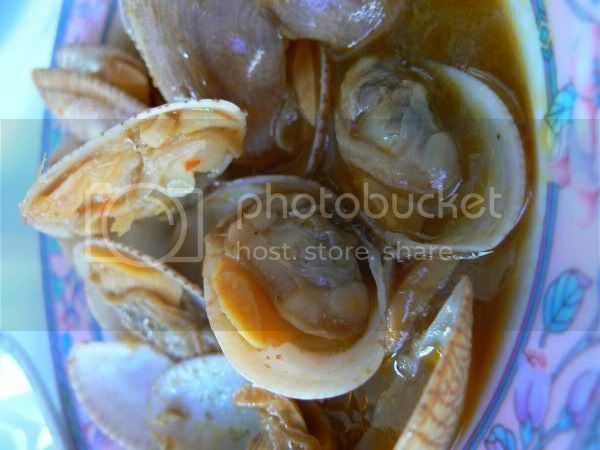 I often go for the clams, which is my favourite. They also have all types of sauces including the smelly but oh so yummy tempoyak. 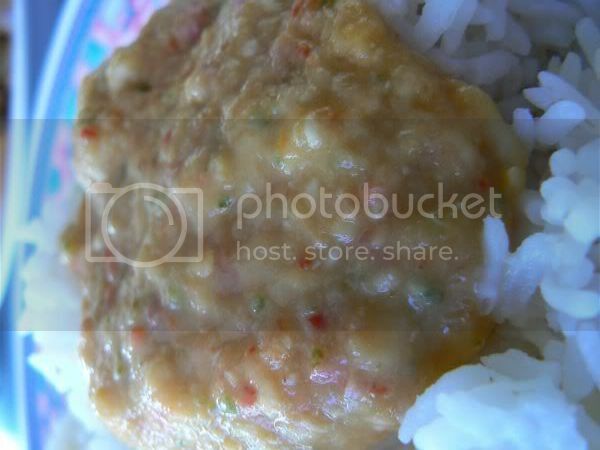 Made from durian, the smell can be pungent but when mixed with chillies, it is a spicy treat great with white rice. The place mainly caters for the lunch crowd but for breakfast, they do sell nasi lemak. If you crave for good Malay food, this is definitely the place to be during lunchtime. A year ago, I decided to work on an index. Sadly I abandoned that as it was too tedious. I'm reviving it again but to kick start my project, I decided to publish what I have categorised so far. Not much, I know but it is a start. It is currently a work in progress, so expect additions to the list, as and when I have the time during the night. Something to tempt you carnivores with. Sadly pictures were taken indoors so quite low light situations again. My mother has been raving about this place to me for some time. 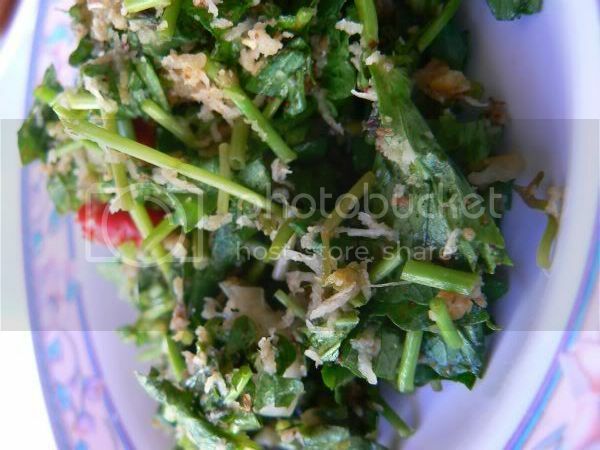 A bit weird since my mother is of the belief, Malaysia has no nice vegetarian food (all starch only). Recently, she has taken to frequenting a reflexology and massage place in Desa Sri Hartamas. Manned by masseurs from China, she told me it is the best, as they are well trained to look for the massage points. Coincidentally, the owner of this place also owns Nature's Vegetarian. Although there is one at Desa Sri Hartamas, the workers recommended the Bangsar outlet instead as more choices are available. Walk into the restaurant just opposite Alexis Bistro, and it is like you stepped back into the past. Heavy Chinese rosewood tables and chairs are used by the diners while, the walls are decorated with figurines of Chinese folk tales and legends. There is even a small stage in front with a karoke machine, perfect for those who think they are the next Frank Sinatra. High on the recommendation list was their home made noodles. A bit weird looking with lots of black soy sauce but believe me, these noodles are great with the slight chewy texture. I enjoyed the accompaniements - choy sum and fu chok. Next on the list was the recommended "soy sauce chicken". Instead of the gluten type of food substiutes, they used monkey head mushrooms. 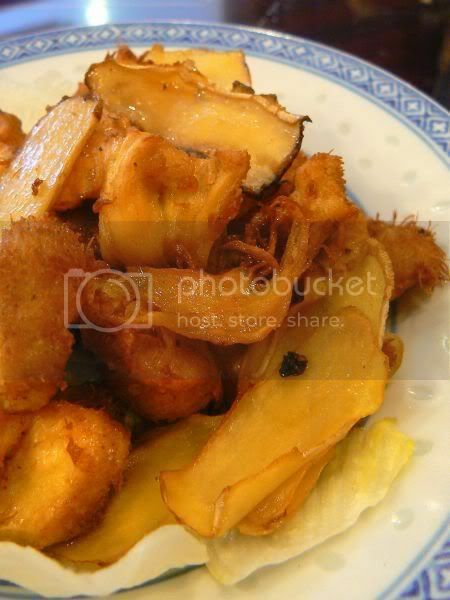 The mushrooms can look scary with their long hair but it is delicious, and chunky (like meat) especially with thin slices of fried ginger. 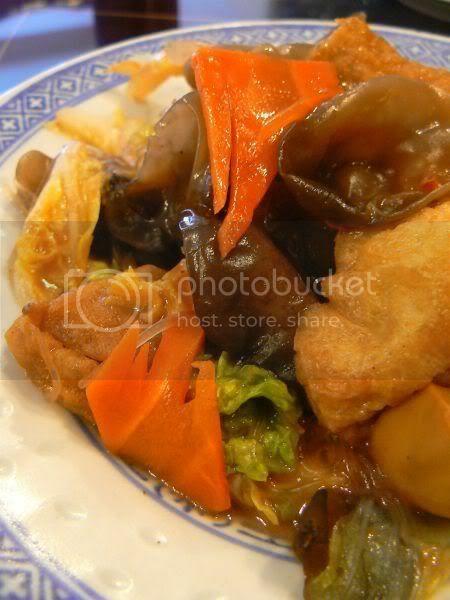 Next is the home cooked vegetable dish, fried with cloud ear's fungus, tung fung (thin mungbean vermicelli), carrots, gingko nuts, tofu puffs. 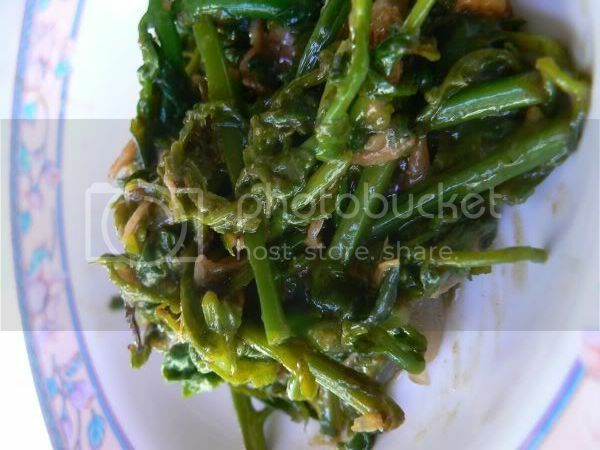 Redolent with nam yue (fermented bean curd), it is best eaten piping hot. Overall, a satisfying meal even though no meat was present. For lunch, they serve dim sum and another popular dish seems to be vegetarian steamboat here, as a few tables for dinner had this item. I am often amazed at how resourceful people are. Take for instance, this abandoned condominium site at Desa Sri Hartamas (which I almost bought!). For years, it has been left empty, with a few pile caps to indicate its existence but now, the old sales office houses this stall, which serves all kinds of Penang goodies. Right next to it is an open carpark that caters to the parking woes of people who work around here, since Desa Sri Hartamas does not have sufficient parking spaces. To sample each of the goodies, you need to memorise their schedule by heart. Just remember, Mondays when life is at the bluest, they serve their very popular Penang curry mee. 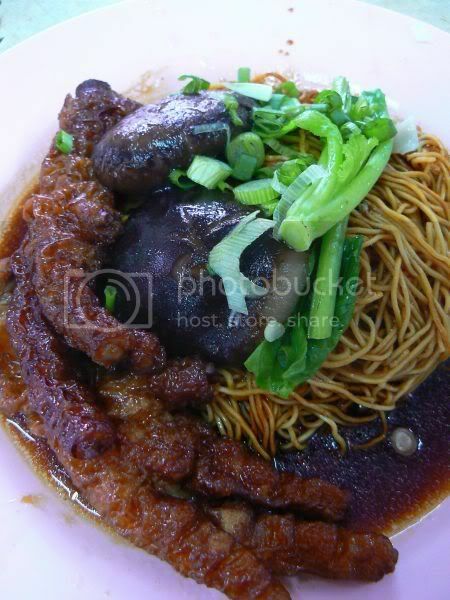 Then for Tuesday and Thursday, it is thickish Loh Mee, while Wednesdays when things are beginning to look up for the week, you get the clear and very healthy tasting Lam Mee. 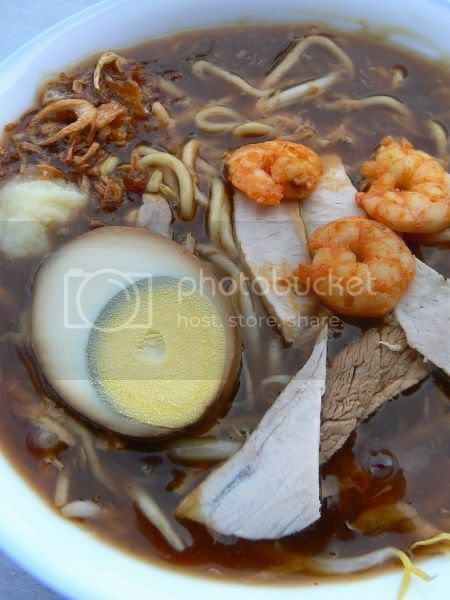 At the end of the week, on Friday, you celebrate it with Har Mee/Hokkien Mee/Prawn Mee. Unfortunately for those who don't work or live within the vicinity, the stall takes a break during the weekends and public holidays. You can however see the stall or the old sales office, open as it acts as a place for the open car park attendant to stay. There is even an air-conditioned section within the sales office. I totally enjoyed trying each type of noodles and my conclusion at the end of the day was this was great tasting stuff minus any MSG. The taste of the soups feel very home made and not overly sweet indicating the prescence of artificial items like MSG. The curry mee is authentic, per my Penang colleague as they serve it with the mint leaves. I love the clear tasting soup full of coconut milk. You can ask for cubes of pig's blood, if you fancy. If not, the noodles are served with brown cuttlefish, cockles, prawns and tofu puffs. 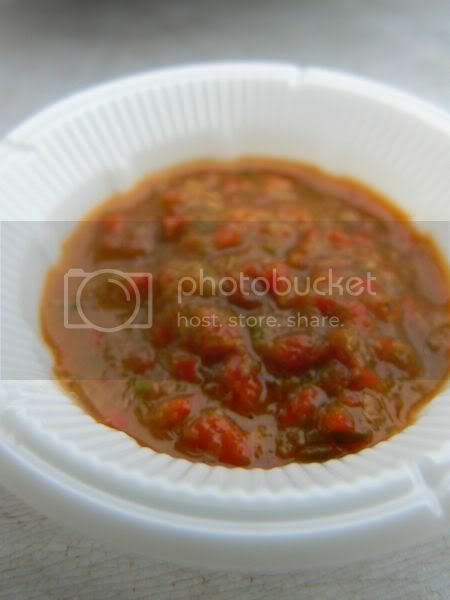 Extra sambal can be scooped from the bottle on each table. The sambal adds the much needed spiciness to the noodles. Loh mee is also served the traditional way with finely minced garlic and a hardboiled egg and pork slices, which have been cooked in a soy sauce broth. 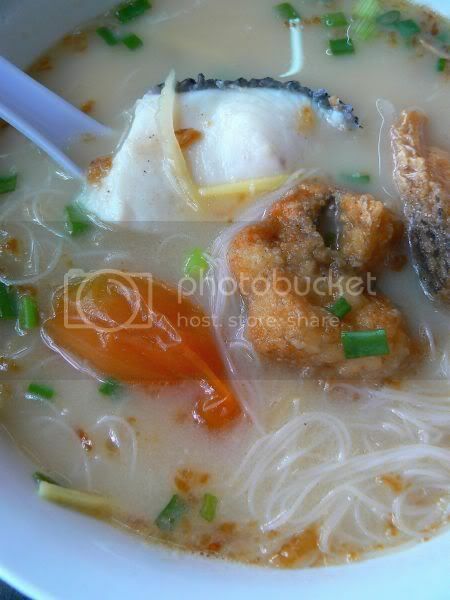 The broth served with the noodles is not overly starchy and fried shallots are added for flavour. The chilli sauce served with it is also good. This is the same sauce served with the healthy tasting Lam Mee. A clear soup is used that is a great favourite of the fitness buffs who frequent this place after working out at True Fitness next door. 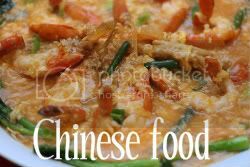 Most of the noodles use similar type of toppings with certain exceptions. 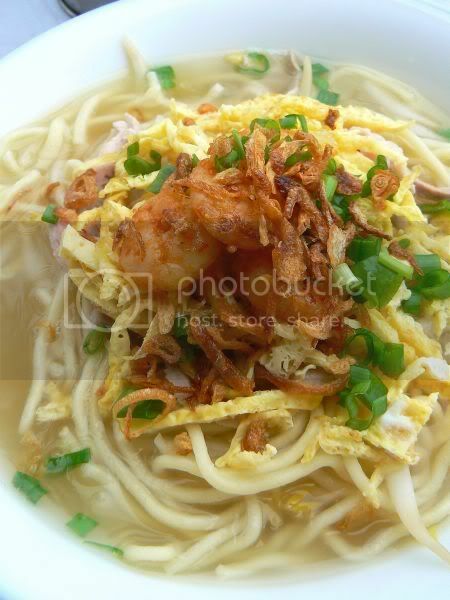 Last but least, it is the prawn mee. Not too thick, the broth is aromatic and delicious. It was so good, I slurped all the broth down, until it was almost empty. Definitely an indication on how delish the whole bowl was. 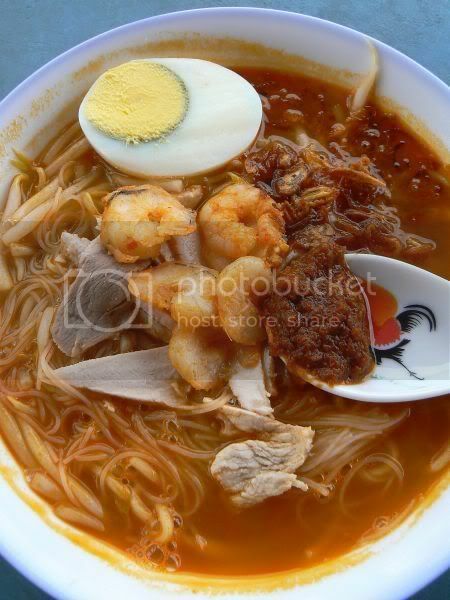 On Friday, Loh Mee is also available as some Penangites love to mix the prawn mee with Loh Mee for unique pairing. Yet to try it but it sounds great. Notice how we seem to follow Singapore in terms of food trends. Not sure why we are always the follower versus the leader. 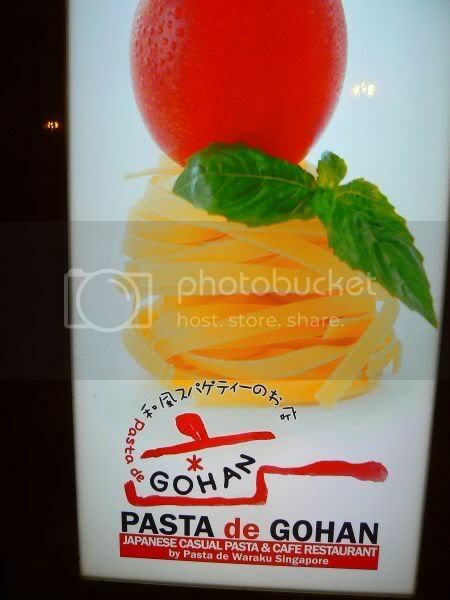 One fine example is the newly opened Pasta de Gohan, a spin off from Pasta de Waraku from Singapore. 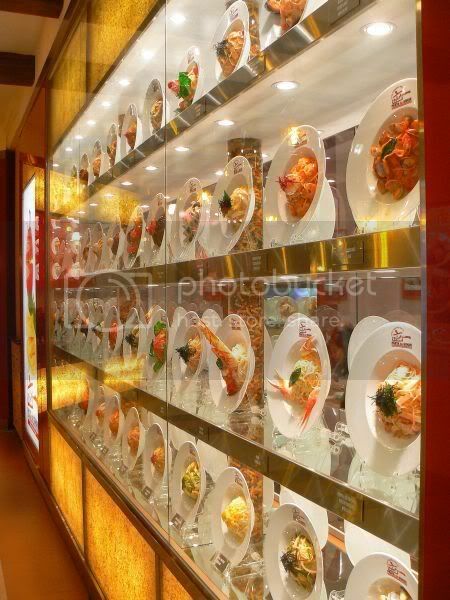 A well established chain of restaurants in Singapore, this outlet at Sunway Pyramid, just opened their doors on 9 May, 2008. For their opening ceremony, they advertised a special promotion for the 9 May, 2008, which involves a 100% rebate in terms of vouchers to be used in your next meal there. Unfortunately, we missed the promotion but we did notice a pretty good crowd of people when we dined here last night. One thing I admire about this restaurant - the enthusiasm of the staff serving. They greet you cheerfully and service is super brisk. Not only is the service excellent, the kitchen is running well as the food they served is up to standard even though they have only been running for 4 days! 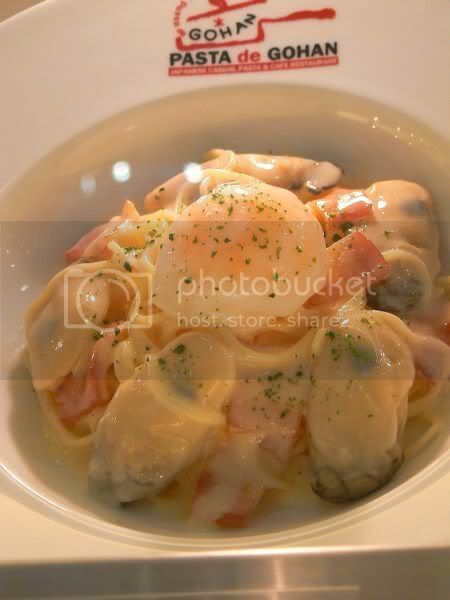 Take your time in selecting which pasta you want as they have about 72 varieties!! If you are a bit confused, you can even walk outside or around the restaurant as plastic replicas of the various types of pasta is on display. There are plain wafu sauces, cream based sauces, tomato based sauces, basil sauce, curry sauce and etc to choose from. If you like to keep healthy, they even have salad pastas. 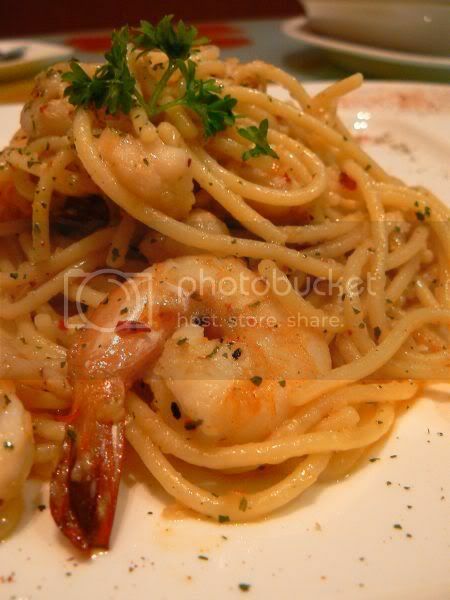 Prices for the pasta dishes range from RM17 to RM33. If you don't fancy pasta, they also serve thin base pizzas (about 13 types), 4 types of gratin (cheese with various toppings, that is baked), 4 types of doria (similar to gratin, except rice is used as a base), hamburg steaks, fried rice, rice pilaf, salads, soups and etc. The pastas have a slight Japanese twist to them using ingredients you normally see in your Japanese meal - fresh sea urchin, salmon roe, salted fish roe, unagi, pork katsu and etc... There is even one with just corn niblets, wafu sauce and a slice of butter. I can imagine that to taste very comforting. For those who love their pork, you will be happy to know, this place serves real bacon. Slightly steaky with that unmistakable aroma. To kick off our meal, we ordered a salad - the salmon avocado, tofu salad (RM18.80). It was a total rip off as the portion was quite small and just enough for 2 of us, as an appetizer. Cubes of salmon, avocado and tofu were tossed with green and purple salad leaves with a wafu dressing. We fared better at our main meal choices. I loved my decadent carbonara. 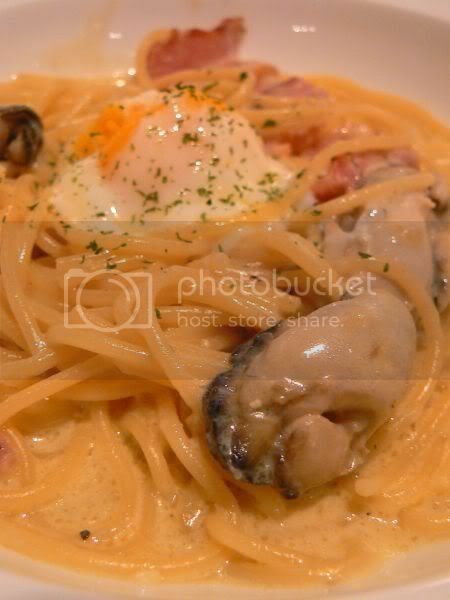 Not too rich, the cream sauce was slightly diluted with the wafu sauce. I enjoyed it with 4 juicy oysters and a generous portion of bacon bits, with a poached egg on top. Simply heavenly. Splashie Boy also loved his sukiyaki wafu pasta. 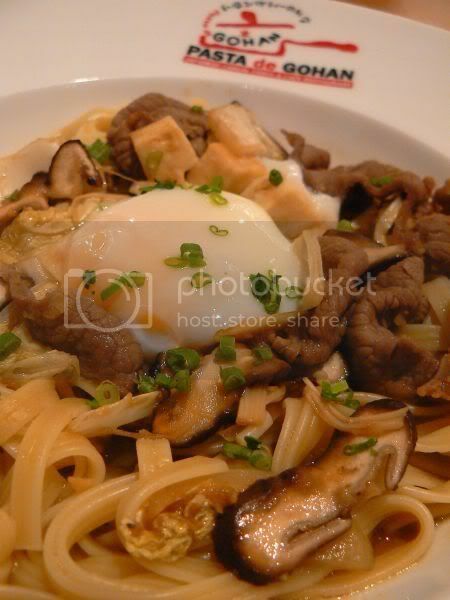 Similar to sukiyaki, you get thin slices of beef, tofu cubes, cabbage and shitake mushrooms tossed in pasta with a delicious thin sauce. Very slurpy stuff, which we both polished off quickly. 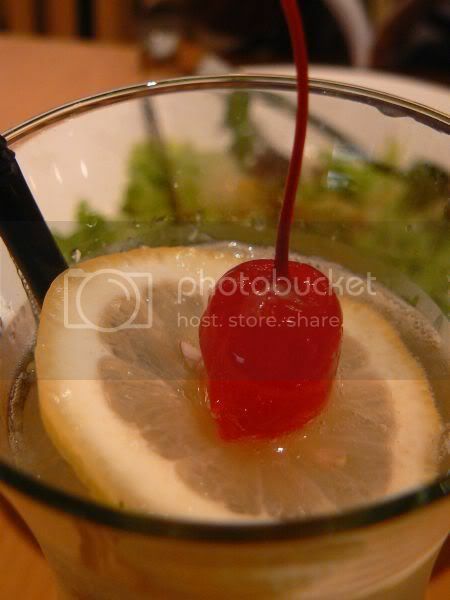 I liked the old style decoration here for our drinks - a cherry with the stem intact. 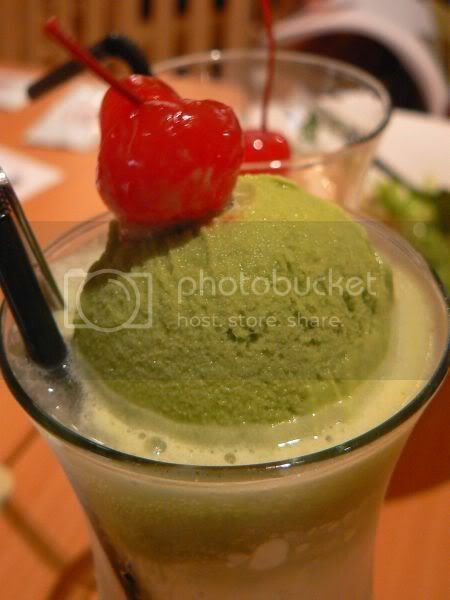 That always reminds me of how the Twin Peaks gal could twist the stem into a heart shape with just her tongue...The maccha float was nice and refreshing but I wish the maccha ice cream had a stronger flavour. We ended the meal with dessert - the maccha parfait. 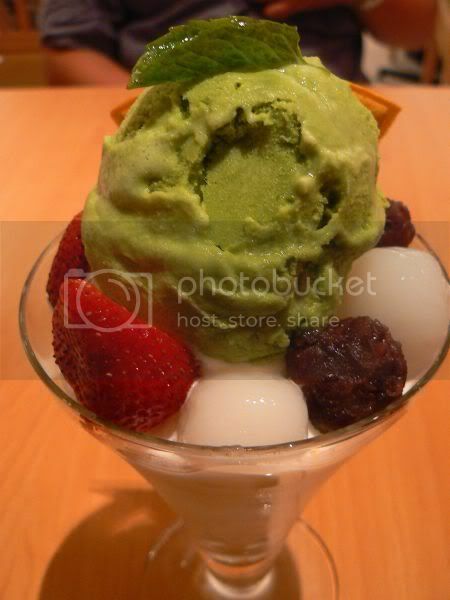 Essentially it is soft ice cream with bits of cornflake at the bottom, topped with maccha ice cream, adzuki paste, strawberries and a type of glutinous rice dumpling. Nice and cooling, my only complaint was their maccha ice cream lacked taste. Overall, we had a very satisfying meal here. We were impressed with the food quality and the service (hopefully it does not go downhill after the opening). 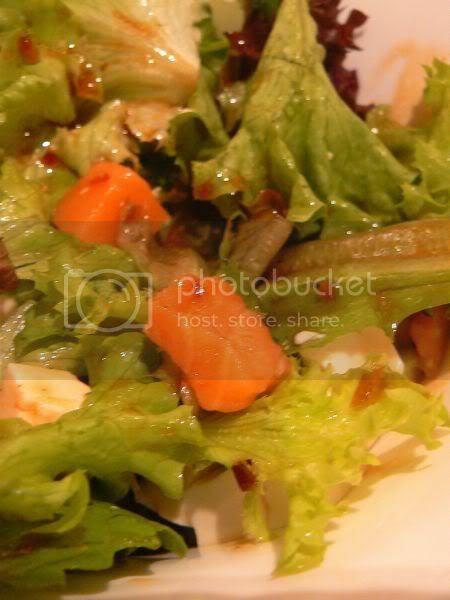 Definitely would not mind returning to try the other dishes but I will stay away from the salads. They also have set meals, which offers better value. Hope everyone's weekend was good. Mine was, since I spent loads of time with my mother especially since Splashie Boy had hightailed to Pahang for a 4WD trip. On to food food food...there seems to be a recent buzz about this place. Although I've known about this place for quite some time, I only managed to check it out yesterday. Even my mum was talking about this place, hence I decided to bring her here to sample the food. For those who live in Petaling Jaya and the Taman Tun Dr Ismail area, you should be familiar with the Jenny Hong vans that sell soy bean milk, tau fu fah and cakes. The stall owner, Jenny Hong also has an outlet at the Taman Tun Dr Ismail market where she sells fresh soy milk and tau fu fah. 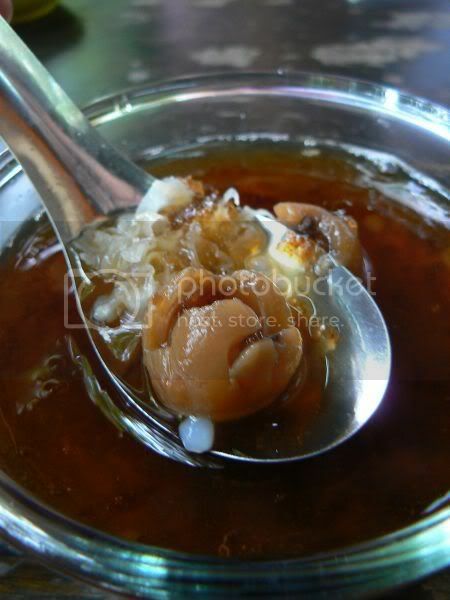 I quite like her tau fu fah, and it is a must for me whenever I visit the market. I first heard about this stall from her (she was distributing leaflets to customers) and this place is run by her husband. Located just after the Damansara Specialist Hospital, the stall is within a row of other stalls which includes Riah Seafood that serves nasi campur including ikan bakar. As they have the corner stall, tables and chairs are laid out in an airy area that faces a few shady trees. Nice and breezy, the place is great to dine especially during this humid weather. The stall serves three types of fish - soong, haruan (sang yue) and mackerel (kau yee). The soong fish is deep fried and used in the noodles, while the haruan fish (sang yue) is sliced and served deep fried or just fresh. 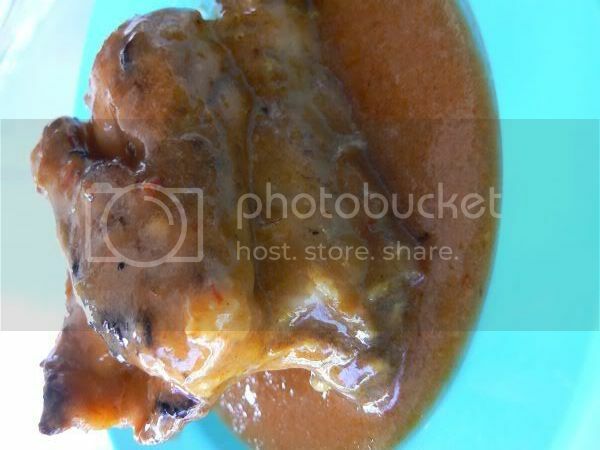 The mackerel fish (kau yee) is the same type they use in stuffing yong tau foo, is made into a paste that is shaped like a metal spoon. To make things easy for all, there is a pictorial menu, with well written descriptions in English. 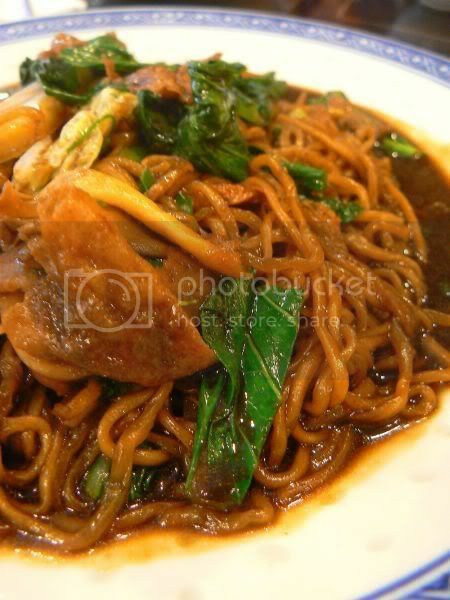 You can choose between the soong fish head noodles, haruan fish slices or fish paste with either beehoon or lai fun. The lai fun is slightly more expensive with an extra 50 sens charge. The soup can either be with or without evaporated milk and is served with tomatoes, ginger shreds, deep fried shallots, spring onions and preserved vegetables (ham choy). A dash of rice wine is also added into the soup. Prices range from RM6.50 to RM9.50, whereby the soong fish head is cheaper and the haruan fish slices, the most expensive. There are even side orders for RM11 per bowl- you can also order fish paste or haruan fish slices with spinach in soup, or just plain haruan slices with soup. 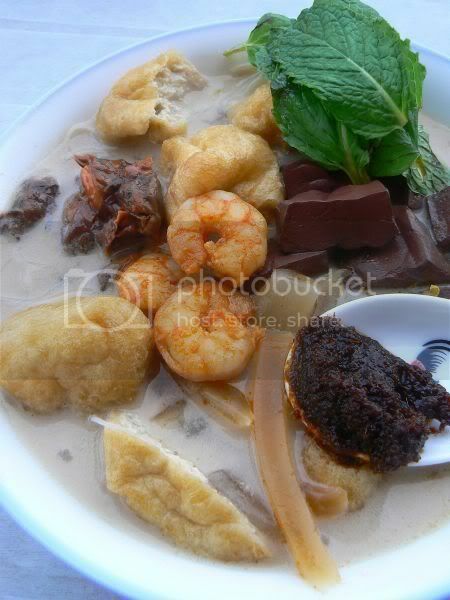 If you have a sweet tooth, they also serve desserts - their signature tau fu fah, cendol, lin chee kang and ais kacang. 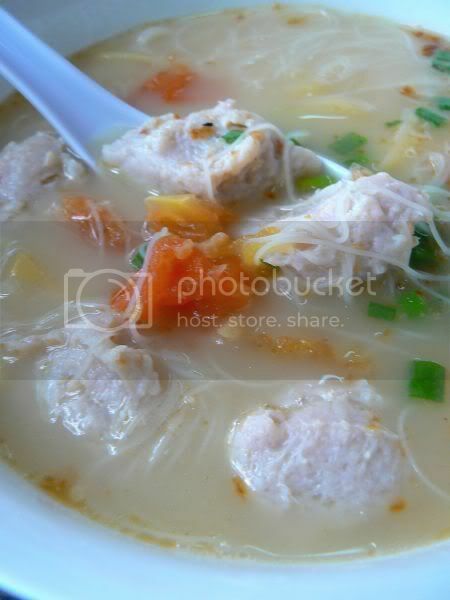 Tastewise, I found the broth, not as sweet and tasty as Woo Pin at Taman Desa. Moreover, the rice wine taste is quite subtle. 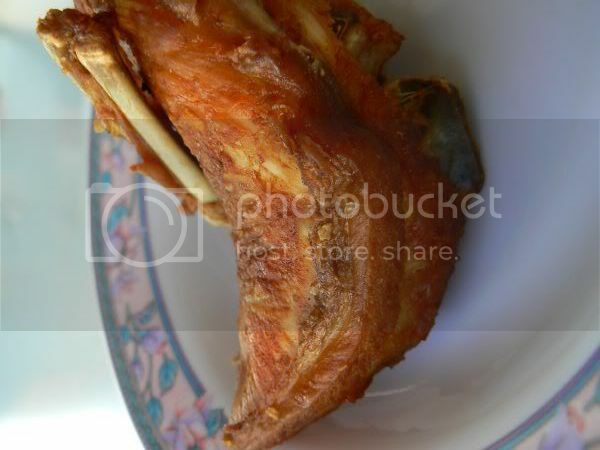 However, the fish used is fresh as seen from tasting the thick haruan fish slices. The fish paste also has a nice bouncy and home made feel to it. The place is a good alternative, if you don't want to drive down to town to sample Woo Pin's noodles especially if you live or work around the Petaling Jaya area. Even though the soup is not as sweet, I liked the fact they use haruan (sang yue), which is much better than soong fish. Some people tend to avoid soong fish, as it is believed the fish is fed faeces or animal waste in the breeding ponds.